Hepburn plays Princess Ann, the royal poster girl of an unnamed European nation, who is on a diplomatic tour of capital cities; spreading good cheer, improving trade relations and saying “yes” and “thank you” and “delighted” at all the right moments, in all the right languages. By the time she reaches Rome she has had enough. Infuriated by her strictly scheduled, pretentious existence, she decides to escape the shackles of her overbearing minders and experience the city with the same freedom as any other visitor to Rome would. One slight hitch in the plan is that she had been administered a sleeping potion and promptly nods off on a wall in front of the Roman Forum in the middle of the night. Cue knight in shining armour, newspaper man Joe Bradley (Peck). With only honourable intentions and unable to garner anything coherent from the all-but-unconscious Ann, who he does not recognise, Joe takes her home and puts her to bed. Not until morning does he realise that he has stumbled on the story of a lifetime. He pretends not to know who she is, she pretends to be “Anya Smith”. They spend a day together. They fall in love. Will he run the story? Will she go back to her life of royalty? Can the fairytale last more than a day? Will true love prevail? You get the picture. As the opening credits of the film roll, it is proudly proclaimed that “This film was photographed and recorded in its entirety in Rome, Italy.” During its famed ‘Golden Age’ practically all Hollywood productions were filmed on set, so shooting on the streets of a European city was certainly a break from the norm. A daring move by director William Wyler given his renowned perfectionism. Having said that, the very polished finish to the picture postcard of Rome that Wyler creates could not be further removed from the grittiness of the Italian neorealist films of the post-war era where the devastating effects of the war were made so apparent. Wyler’s objective here, however, is to express the wide-eyed excitement and freewheeling spirit of the liberated princess rather than comment on the recovery of a city, and a people, that had suffered so much. He does so with aplomb. Whilst colour film was available to him, Wyler’s decision to shoot in black and white paints the city streets, the Spanish Steps, the Trevi Fountain, the Castel Sant’Angelo and the Colosseum in an antiquated, but reverent light and gives the film a nostalgic timelessness that does not detract from the central love story. A bright wardrobe and all the colours of a vibrant city would have taken away from the well-written, beautifully acted script. The film’s writing credits are themselves of great signifi- cance. The screen capture to the right is not what an audience in 1953 would have seen when the lights went down. 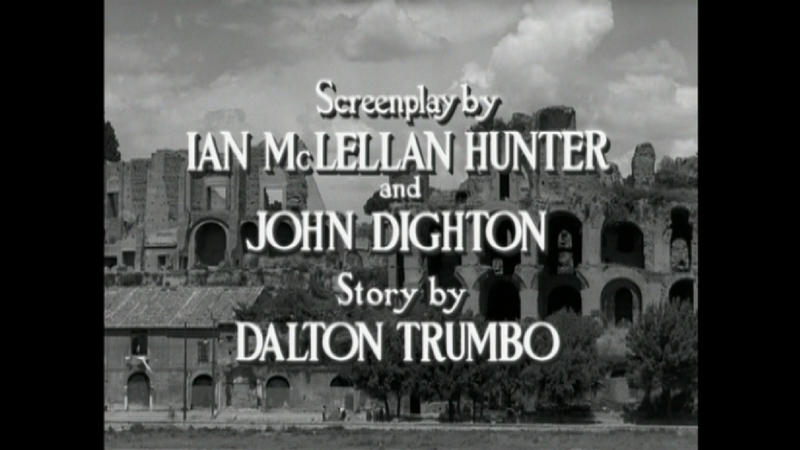 Dalton Trumbo, one of Hollywood’s most gifted screenwriters from the 1930s onwards, died in 1976 – a long time before the credit that was due to him for the writing of Roman Holiday would be made. 1947: Believed to be a communist sympathiser, Trumbo was called before the House Un-American Activities Committee (HUAC), a board whose remit was to route out communist propaganda which they believed was being disseminated through Hollywood film. Given the absence of any kind of proof, Trumbo refused to testify, instead choosing “to challenge the right of the committee to ask such questions”. Although it would later be shown that he was a member of the communist party, this was not illegal. Jailed for contempt of congress and blacklisted, Trumbo became one of the Hollywood Ten – a group of screenwriters and other film professionals who were stripped of their right to work in the industry. More than 300 would follow the infamous ten as the Cold War and threat of communism engulfed America; many presumed guilty until proven innocent. The unlawful actions of the HUAC mark a dark stain on the history of Hollywood. Such was the paranoia of the early ’50s in Tinseltown that Frank Capra, who was originally supposed to direct the film, dropped Roman Holiday due to Trumbo’s association with the HUAC. Willi Wyler stepped into the breach. When the script went on to win an Oscar, Trumbo’s fellow writer Ian McLellan Hunter would have to accept the honour on his behalf. The blacklisted Trumbo continued to write screenplays under pseudonyms for many years but a decade would pass before the tide began to turn. Actor Kirk Douglas came forward with Trumbo’s name for Stanley Kubrick’s epic Spartacus (1960), Otto Preminger hired him for the equally epic Exodus (1960) and down came the HUAC’s house of cards. It would be nearly 60 years before Trumbo was officially credited for Roman Holiday and his name be added to the film. So is there any truth in suggesting that Trumbo’s writing reflected his ideologies? I don’t think so. Not here anyway. Although Roman Holiday presents us with a princess fleeing her regal duties to slum it with the commonfolk, it is far too heartfelt, heartwarming and carefree to be considered communist propaganda. That’s not to say that it lacks depth of feeling. It is a simple story of star-crossed lovers which is played perfectly by the film’s two leads. Hepburn is radiant from start to finish. The unknown, but soon-to-be Best Actress Oscar winner had never had an acting lesson in her life and only came to fill the role because both Elizabeth Taylor and Jean Simmons were unavailable. Her own rise to fame was just as much a fairytale as the day she spends seeing the sites of Rome as “Smitty”. Perhaps this is why the doe-eyed, awestruck innocence of her performance seems so natural, humble and sincere. The experienced Peck is charming, gentle and swiftly enamoured by his beautiful counterpart. Will he betray his conscience and publish his scoop? Taking the pictures is sidekick Irving Radovich (Eddie Albert) who is energetic, frenetic and thoroughly engaging – far from being an awkward third wheel. Roman Holiday is an endearing, and enduring, classic. Richard Curtis undoubtedly had half an eye on William Wyler’s film when writing Notting Hill at the end of the 90’s and a bumbling Hugh Grant and ever-smiling Julia Roberts didn’t quite live up to their predecessors. They certainly don’t make them like this any more but even 60 years on, the timeless Roman Holiday still feels fresh and is a delightful film. Posted in Classics, Oscars and tagged Audrey Hepburn, Dalton Trumbo, Gregory Peck, Hollywood, Hollywood Ten, House Un-American Activities Committee, HUAC, Roman Holiday, William Wyler. Bookmark the permalink.